In 1987, David Goodman got a dream job for a ski bum trying to survive as a freelance writer: the Appalachian Mountain Club hired him to write a guidebook for backcountry skiing in New England. 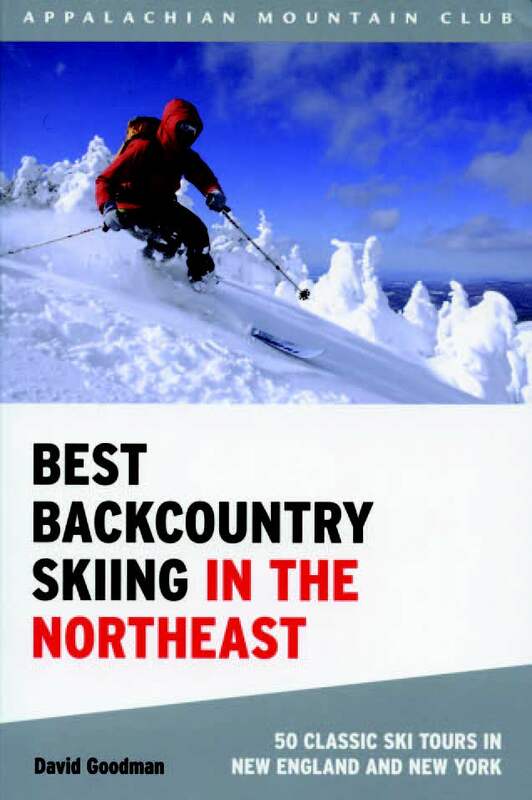 The following year the club published Classic Backcountry Skiing: A Guide to the Best Ski Tours in New England. Unlike most ski-touring guidebooks, this one focused on down-mountain runs rather than rolling terrain, and it came out just as telemark skiing was enjoying a rebirth. Goodman later expanded his horizons westward, and in 1999, AMC split the book into two volumes, one covering New Hampshire and Maine, the other covering Vermont and New York. 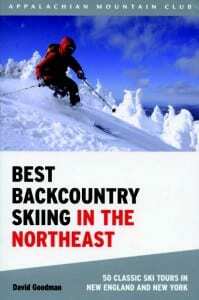 Now Goodman has again combined his offerings into one volume, Best Backcountry Skiing in the Northeast. This is a good idea. For one thing, it avoids the necessity of twice printing the lengthy introductory section, which covers such topics as the history of backcountry skiing in the Northeast; clothing and ski equipment; and mountaineering skills. For another, I think a backcountry skier in the Adirondacks would want to know what New Hampshire has to offer and vice versa. The Johns Brook Valley chapter describes three trips that can be taken from Camp Peggy O’Brien, a hut owned by the Adirondack Mountain Club: Klondike Notch, some low-angle slides near Gothics Mountain, and Bennies Brook Slide on Lower Wolf Jaw Mountain. Bennies Brook Slide is a new addition, replacing a description of ski glades on Big Slide Mountain. This is the only change in the New York State section of the book. The Marcy, Avalanche Pass, and Jackrabbit trips also can be found in Ski and Snowshoe Trails in the Adirondacks, written by Tony Goodwin and published by the Adirondack Mountain Club. Goodwin’s book covers the whole Adirondack Park, but it focuses more on traditional ski touring and sticks to offi cial trails. His is the book to get if you prefer novice or intermediate terrain. Most of Goodman’s trips, in contrast, entail a significant climb and descent, and he often leads skiers off piste. Examples of the more extreme terrain are the Gulf of Slides and Tuckerman Ravine on Mount Washington, the gullies on Mount Katahdin, and of course Mount Marcy. Goodman does offer some tours of moderate difficulty, but his book is definitely aimed at advanced-intermediate and expert skiers. If you’re in search of downhill thrills in the backcountry, there is no better guide to the Northeast.